SMS choral students underwent two rigorous auditions to place in the 2019 All-State Choir by taking written theory tests and sight reading music they had never seen before. The pictured students qualified for All-State weekend (Jan. 10-12) and were chaperoned by their music teacher and their parents. They were inspired to work with and learn from talented guest conductors and composers, spending 6-8 hours a day rehearsing with other top student singers from around the state. 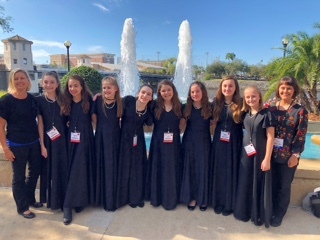 Their hard work was showcased at a “sold out” concert at the Straz Center in Tampa, which was attended by their assistant principal, and they eagerly returned to SMS to inspire other students to work hard and achieve as they have done.